The hotel operates a valet parking service 24 hours per day. This service is €25 for the first 2 hours and €10 for any additional hour. Alternatively, the closest public car park is the Q-park Marnixstraat located next to the bus station and the Texaco gas station. This car park is priced at €40 per 24 hours and is a 10 minutes walk from the hotel. 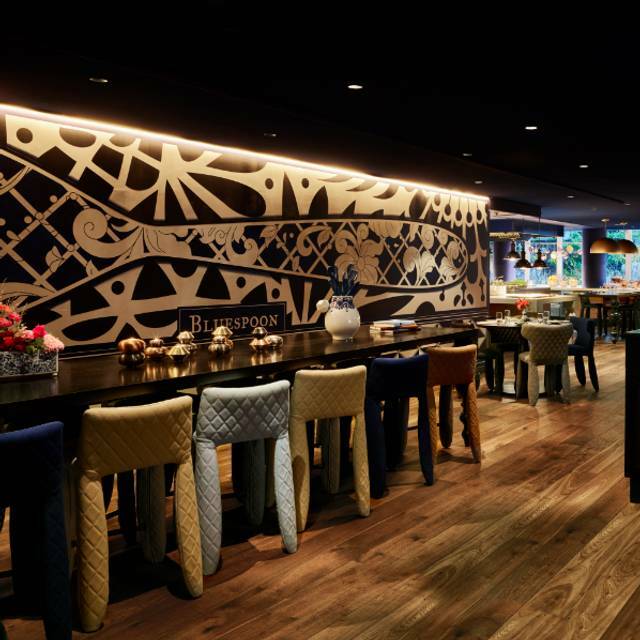 In a quirky Marcel Wanders-designed setting on the canals, Bluespoon Restaurant takes the stiffness out of traditional fine dining, adding a light playful touch to a special dining experience in which every seasonal plate is a fresh and colourful work of art. No compromises are made on the quality of the food however, as the menu presents creative European dishes celebrating the best of Dutch ingredients with a unique modern twist. 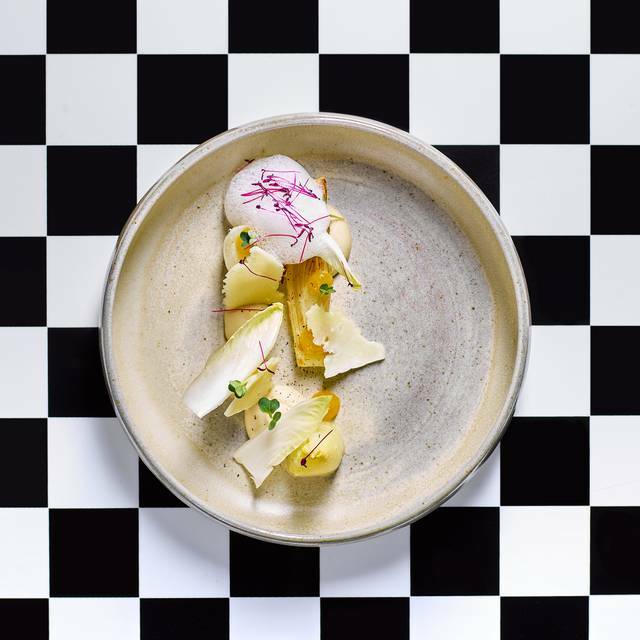 Led by Executive Chef Sander Bierenbroodspot, the Bluespoon team, a team from around the world but firmly rooted in Dutch soil, hope to delight, be it with an interesting story, a forgotten classic, a unique cocktail pairing, or an ingredient you might never have tried. The restaurant is gorgeous, with an open kitchen! The service was unacceptable. We waited over an hour to get our first course from a 6 course tasting menus. Other diners who came in after us received their meals way before us. When asked what was going on our server said he would look into it and offered us more wine. When we asked again our server apologized and said he would get right on it. We canceled the rest of our meal. The restaurant was not busy... no explanation was given for the very poor service. We paid our check and left. The server was very nice, but didn’t make up for the unacceptable dining experience. We were looking forward to a fine dining experience on our last night in Amsterdam. That was not the case. Very disappointing. One of the most original and satisfying meals (not only a brunch) that we've ever had! The presentation and taste combinations were truly unique and outstanding. Service was top-notch and the atmosphere was splendid. Absolutely Awesome Easter Sunday Brunch!! THANK YOU. Amazing food. Attentive staff. Tasty Cava. Beautiful location. And best of all the kids absolutely loved the Egg Hunt in the garden and all the activities. Thank you again to Bogdana and all her fantastic passionate team for a wonderful day. Look forward to seeing you next year! Cheers! Chris and family. Great food ruined by slow service and no pace of dining. Dishes would arrive one after another or with an exceptional delay between courses. Shame really as food was very good . A wonderful experience! If you are in Amsterdam do not miss this restaurant. The food was excellent and the staff was well-informed and helpful at every step. The prix fixed menu was interesting and presented new flavors. There is an unprinted vegetarian menu. Everything was beautifully plated; however you need to be prepared for a 2 to 3 hour leisurely dining experience, not a quick meal. There are a lot of salty flavors, even in the savory desserts. I don't know enough about Dutch cuisine to know if this is common, but be prepared for -- as an example --salted apples in the dessert. This is definitely a place to visit multiple times. The 4 course menu is a good value for the experience. Even turning up as a vegetarian and having the set menu. Incredible experience. Every bite was exceptional. This hidden gem of a place is tucked away in a typical Amsterdam street by a canal and once you step inside you leave behind the cobbled streets and enter a calm oasis of creativity. The reception has a high ceiling with an innovative light system and this opens out onto an open kitchen and dining area...soon you realise every corner has some surprising and entertaining art and you simply have to photograph it. The chef's creations are no less artistic and in keeping with their surrounds, but definitely not form over function as the artistic beauty of the presentation was equalled by the flavour. What could have been simple dishes of Mussels and Halibut were elevated by the colourful presentation with good use of micro herbs and edible flowers. The Wine list enabled us to choose a local wine from Zeeland which complimented our meal perfectly. Staff too, couldn't have been more accommodating, recognising our need for a quiet corner and also that we had a deadline on our exploration of Amsterdam. Al-in-all...five stars! Really nice brunch but for the price they should be a little flexible when it comes to a small change in the main course. Very nice restaurant. Quiet, good service and excellent value for money. The menu with the wine paring is perfect. Exceptional food, creative preparation and presentation reflecting Dutch influenced, internationally infused flavours. A multi course tasting menu offers a range of tastes in quantities that allow to feel satisfied but not over-fed. Highly recommended. It s a nice plate for date night if you like experimental dining. You also have flexibility with the menu and can order either a 4, 5 or 6 course menu. What an amazing restaurant! The service was great, the food was even better and the explanation with every dish and wine was fabulous! We were very much suprised by the quality! It was our first time, but for sure not our last! The concept of bluespoon us not client friendly. You are obliged to take at least a four course menu. If you want to skip one dish you pay the a la carte price that makes three courses more expensive than four! They don’t offer the a la carte options. Waiter told this is a pilot and they will change it again. Come on!! Wines are extremely expensive, by the glass the cheapest option is 8 euro, and for that they give a bottom in a glass. I would not recommend to go here, which is a pity because the design of the place is great and the food pretentious. Prettig ontvangst, leuke enthousiaste internationale bediening. Mooie gerechten met verrassende wijnen. Jammer dat het restaurant blijkbaar nog als ‘hotel restaurant’ ervaren wordt. We had a very nice 4 course dinner with wine pairing . The service was impeccable . Highly recommended! Will go back for my next dinner. Overall we had a very good experience at BlueSpoon. The staff was very kind and the food was delicious. The menu and the wine pairings were great! The only slightly annoying thing was how fast the food came. We had often not even finished our wine from plate one, or another wine and the next plate would come. Right before dessert we asked for some time in between and they did give us the time we asked for. So if it's going too fast for you, just ask them to slow down! We loved our evening here. Would definitely recommend. We enjoyed the food and the service! Great to see the former public library back like this. Great explanation of the menu. Attentive too. Superleuk, de Mad Hatter's Brunch! We ordered 3 course tasting menu and overall food was ok but not great. Dessert was disappointing. If you like Moooi, it is a good place to go. The Andaz Hotel lobby has fascinating Moooi Lighting. Booked on the new year eve menu, not cheap but great quality food, beautifully presented. The dinning room decor has a design edge and manage to remain fairly intimate. Great wine pairing recommendations and great service, not a cheap restaurant by any mean but would recommend for a special night out. Me and my girlfriend spent New Years Eve having dinner at Bluespoon. A very friendly waitress took our jackets and we got an excellent table. We got free champagne and our waiter provided the best service I've had in a long time and that made us feel very welcome. We had the five course NYE dinner and although the dishes were quite small, they were delicious and filled us up. Only exception was the rabbit that was shaped like a hot dog and wrapped with bacon. That did not feel very fancy at such a nice restaurant nor was it particularly tasty. A nice and knowledgeable waitress always explained what was in the food she brought us. Our friendly waiter suggested one red and one white wine that went really well with food and we even got one of them for free, which was a really nice gesture. Afterwards we had a cocktail at the bar that were both excellent! Due to friendly staff, nice music (good volume) and cool venue, this was one of the best restaurant experiences both of us ever had and it made our NYE a very memorable one. We will definitely be back next time we're in Amsterdam. Wonderful atmosphere and extremely attentive staff. Food was delicious and full of surprises. On point consumer experience! This place is now on top of my list places to go to in Amsterdam. Cannot fault a thing. Beautiful restaurant, first class service, delicious food and wine. Not cheap, but well worth it for a 5 star experience. The ambiance was amazing. I really like the design, open kitchen, great furniture and lighting. The food was very creative and delicious. One of the desserts, which was amazing in presentation, was a bit off on texture, but overall a solid 4 course experience. I took my nephew there for a special celebration (30th birthday). Despite the fact I had mentioned this in booking. I was disappointed that there was no recognition by the restaurant. Otherwise all good. The restaurant is situated within a hotel so there is a good mix of customers. The 3 course menu with paired wines was very good but food preparation did not really live up to what I would expect of a higher level restaurant. The duck was tough and the portion small even by tasting menu standards. The undoubted star of the night were the wine pairings suggested by the Sommelier who was both interesting in her explanation of the wines and informative on the reasons behind her choices. Creative cuisine with local ingredients. Tried the 4 course menu with wine pairing. Wine pairing was excellent and I would say that 2 out of the 4 courses were too. The other two were average. Considering the excellent service and the modern but comfortable environment, I would go back for a special occasion only, since I consider it a little over priced. Such a great night at blue spoon. The food was amazing and the staff couldn't be more helpful. Our server had excellent wine knowledge and was very helpful in helping us select dishes. 5* from us.